We have a new optional feature that has us selecting teams for your weekly game. Our hope is that this will save you and your crew time each week. You won’t have to pick teams and every skater coming on the ice doesn’t have to count up darks and whites before stepping on the ice. I also have a dream that it cuts down on the number of yellows and reds! As well, hopefully it allows the games to start quicker and make good use of your ice time. Currently, it’s random but as an organizer, you can adjust the lineup behind the scenes if you want. 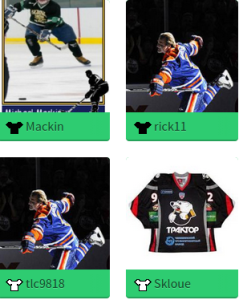 We have a lot planned for this feature, including having captains pick teams and even the ability to make some trades. For now we’re keeping it simple, I wanted to share some details on how it works today. Every player is assigned to the white or dark team when they join a game. They can immediately see which team they’re on based on the white or dark jersey by their username on the game page. As an organizer, you can go ‘Behind the scenes’ on your game page to see the current numbers for each team. Under the team column, you can see which team each player is currently assigned to. Clicking on “change team” flips them to the other team. That’s it, simple as pie. When we send out our gameday reminders to the people playing in your game, we let them know what team they’re playing on. Let us know if you want it turned on for your game? This entry was posted in Organization Tips on February 2, 2015 by brydon.